On June 20 ROSS+associates' replied to an earlier version of this critique with this memorandum. The primary criticism is that forecasts of a population requires an analysis, at the minimum, of the underlying crude birth, death, and immigration rates. ROSS+associates' use of simplistic function regression on population counts is not a valid technique. Furthermore, a population undergoing significant change, as is Hall County, requires an analysis of the major demographic components found within that population. Ideally, age specific birth, death and immigration rates for each demographic component should be studied. The 1985 Georgia County Guide forecasted Hall County's population would grow to 97,906 in 2000. Using the 2000 census which is acknowledged to undercount the Hispanic population, that forecast missed 41,371 people, of which 27,242 were Hispanic. 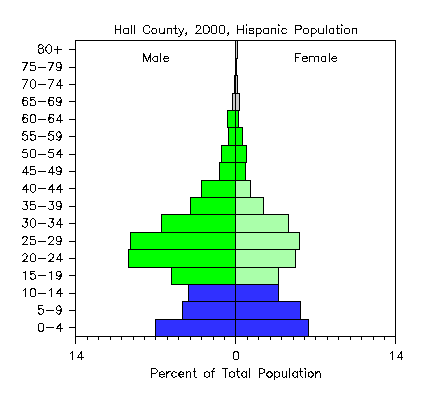 Hence, at least 66% of the unanticipated growth in Hall County was Hispanic. This percentage increases even further when the undercount is taken into account. Using Doug Bachtel's estimate of the undercount of 2.5, the percentage of unanticipated growth attributable to Hispanic immigration increases to 83%. This is significant in light of the high birth rate found in Mexico and that the majority of Hispanics in Hall County are from Mexico. In 1970 Mexico had the highest birth rate in the world outside of Africa with the average Mexican woman having 6.7 children. Due to a strong government campaign to reduce birth rates, Mexico had reduced their natural rate of increase to 1.8% by 2000. A likely scenario is for Hall County first generation Hispanics to mimic their native cultural's natural growth rate. ROSS+associates compares Hall County's growth to Gwinett and Cobb Counties. However, Gwinett and Cobb Counties primarily reflect growth pressure from metro Atlanta. Hall County's growth is primarily driven by Hispanic labor immigration. This difference will be reflected in future patterns of immigration, births, and deaths. The initial wave of Hispanic immigration was job driven. Construction boomed in Hall County through the 1990s along with the United States economy. Poultry jobs opened up as Asians departed. These construction and poultry industry jobs were filled by Hispanics immigrating into the county. Most Hispanics are living in the community where they work. 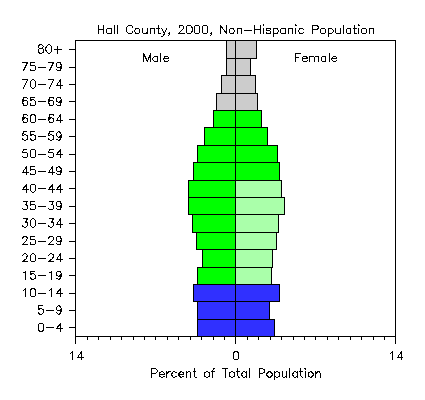 The Hispanic population pyramid for Hall County 2000 shows a bias of young adult males. The flow of Hispanic male laborers will taper off if labor jobs are not available. However, those young adult Hispanic males who have settled in the county will bring over family members and have children at roughly the same birth rate as is found in their native culture. It is important to consider the different underlying causes of growth in Cobb and Gwinett Counties from Hall County to properly forecast growth in Hall. Given that ROSS+associates performed a simplistic function regression on population time series data, they incorrectly regressed on data that had already been smoothed by equations for the intercensal years between 1990 and 2000. This smoothing can be seen in the following graph of total housing units (10,000s) and new housing units (1,000s). Notice the variation in new housing units data that corresponds to the normal variation found in real historical data. 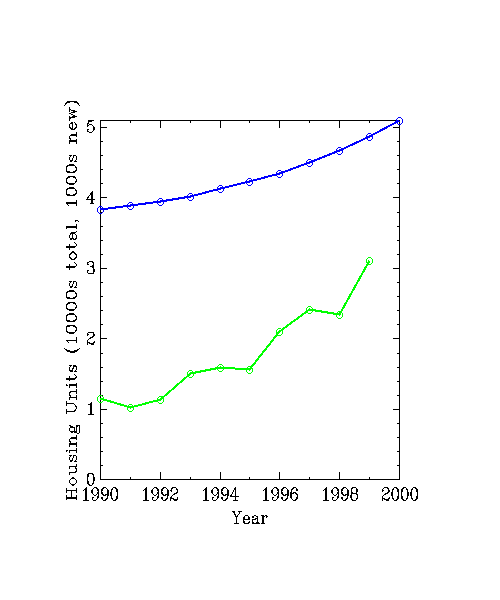 The total housing units data has obviously been smoothed by equations. ROSS+associates uses the smoothed total housing units data to generate the intercensal population estimates and then feeds these smoothed population estimates into their function regressions. Once historical data has been smoothed with an equation it is guaranteed that a similar equation will artificially have the best fit. No reliable statistician would attempt to regress higher ordered functions on data that has already been smoothed by a higher ordered function, and then claim any validity to the goodness of fit measure of the resulting regressed function as ROSS+associates did on page 8 of their report under Initial Results. Using ROSS+associates' yearly population data for Hall County from 1990 to 2000 a time series was created using The Coca-Cola Company's Interactive Forecasting System. Of the six functions regressed on ROSS+associates' data the modified exponential function (y=C0+C1*C2**t) had the best r-squared (goodness of fit) of .999825, versus .961950 for the linear, and .999115 for the quadratic. The modified exponential function predicts Hall County population in 2030 with a 90% confidence interval to be between 3,762,907 and 3,765,376. By comparison, the linear function predicts Hall County population in 2030 with a 90% confidence interval to be between 243,308 and 279,135. There are two points to be made. One is that the artificially smoothed historical data shows up in the artificially near-perfect r-squared values. The other is that higher ordered functions are seriously prone to error when extrapolated out, for instance, thirty years from ten years of data. Table P-5 on pg. 7 of the ROSS+associates report used housing building permits to generate intercensal population estimates for the years 1991 through 1999. The same technique can been used to extend the population estimates out to 2003 based on 2000, 2001, and 2002 housing building permits. Doing so provides Hall County population estimates of 144,459, 148,900, and 153,902 for the years 2001, 2002, and 2003. Regressing first, second, and third order equations on the ROSS+associates' population estimates for 1990 through 2000 combined with the population estimates for 2001, 2002, and 2003 yields new Hall County forecasts for 2030 summarized in the following table. Note that the second order function used by ROSS+associates to generate their high forecast found in Table P-11 on pg.11 and the foundation of their most likely forecast, drops from 603,730 to 476,728 for 2030 when the regression includes recent population estimates. Omitting this recent available data inflated the high population forecast in 2030 by 27%. The change in the 'ess' function is more dramatic with the revised forecast for 2030 dropping to a negative population. As noted earlier, "... higher ordered functions are seriously prone to error when extrapolated out, for instance, thirty years ...". The following table documents the 2001, 2002, and 2003 population estimates used in the above regressions. These recent population estimates are created using the same techniques used by ROSS+associates to generate their intercensal estimates for Hall County, as found in Table P-5 on pg. 7. Notes after the table contain detailed explanations of the data sources. Gainesville and unincorporated Hall County housing units permitted data for 2000, 2001 and 2002 is from the Gainesville-Hall County Building Inspections Department. Total housing units permitted in 2000 is from census data. Total housing units permitted in 2001 and 2002 are estimates generated from the 2001 and 2002 Gainesville and unincorporated Hall County housing units permitted numbers multiplied by the average ratio for these numbers for 1998, 1999 and 2000. Gross housing units is calculated as prior year housing units plus prior year housing units permitted. Total housing units for 2000 is from census data. Discounted housing units for 2001, 2002, and 2003 is the average of 1991 to 2000 discounted units. Percent occupancy for 2001, 2002, and 2003 is 2000's value carried forward. Given the current high vacancy rate and record number of foreclosures this seemed a reasonable estimate that favors a high growth rate mental model. Persons per household for 2001, 2002, and 2003 is estimated from a first order linear regression on 1990 to 2000 data for persons per household. Population in group households percent for 2001, 2002, and 2003 is estimated from a first order linear regression on 1990 to 2000 data for population in group households percent. Differences between ROSS+associates' totals, as for Hall County Total in 2000 and the unrounded figures in the above table are due to round off of percentages and rates as printed in their report and the actual numbers used. For instance, for 2000 in Table P-5 on pg. 7 if you multiply 51,046 by 92.8% you arrive at 47,371, not the 47,381 shown on the table. What is happening is that the percent number used in their calculations has more decimal places than were printed in the report and rounds down to 92.8%. This analysis of ROSS+associates omitting recent data in their regressions is not an endorsement of these techniques to forecast Hall County's population growth. ROSS+associates' data removes 5,259 housing units between 1991 and 2000 (Table P-5, pg.7). Given that it is rare to remove a housing unit less than 10 years old these 5,259 housing units would have been deleted from the 38,315 housing units stock in place in 1990. By this accounting approximately 14% of Hall County's entire 1990 housing stock was removed by the year 2000. A more realistic measure of removals comes from the Gainesville-Hall County Building Inspections Department's data for permits issued for demolition versus construction of housing units. Demolition permits were not required until a few years ago so only data from 2001 and 2002 is used. Also, there is no guarantee that all removals obtained the proper demolition permits. As such, these numbers are indicators of the approximate size of the ratio of additions to removals and not precise numbers. By comparison, ROSS+associates' average ratio of added to removed housing units is approximately 3:1. Removal of one housing unit for every 27 added is likely; the removal of one housing unit for every 3 added is not. ROSS+associates ignores the census Hispanic undercount (see Failure to Include an Estimate of the Hispanic Undercount). This undercount corresponds to unreported housing units. ROSS+associates are therefore forced to apply unrealistically steep discounts to the housing stock to push the more solid data of building permits down to underreported census housing stock numbers. ROSS+associates' population estimates assume that the 2000 census counts are accurate. No mention is made of the Hispanic undercount and no adjustments based on the undercount are made. Doug Bachtel of the University of Georgia estimates the Hispanic population in Hall County in 2000 at 2.5 times the census count of Hispanics. A Hall County apartment owner surveyed the Hispanics in one of his complexes shortly after the 2000 census and noted that only 50% responded, which corresponds to a correction of 2.0. Another undercount estimate based on building permits issued and the average number of Hispanics of Mexican origin per household for the United States as taken from the Census March 2000 Supplement has a 1.25+ correction factor (building permit data is still being collected from some municipalities, hence the '+' sign). 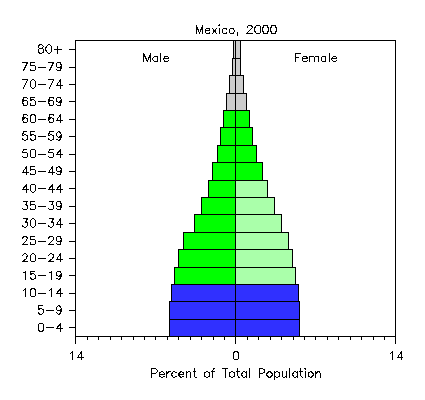 Another estimate can be garnered from the average fertility rate in Mexico in 2000 of 9.3% (births per 100 women aged 15 to 44) and the 1,031 Hispanic births 2000 and determining the total Hispanic population from the census 2000 pyramid for that population, which yields a correction of 1.77. Finally, while Census Bureau does not endorse an estimate of the 2000 undercount, their official estimate of the 1990 undercount is 2,257. If we assume that this undercount is composed primarily of Hispanics then the 1990 correction factor for the Hispanic count is 1.5 and it is not unreasonable to use this as another estimate of the correction factor for 2000. Whichever estimate of the undercount is closest to reality, ROSS+associates' failure to acknowledge the Hispanic undercount implies they have not considered the long term effect of cultural differences on growth. Further discussion of the 2000 Hispanic undercount can be seen here. Based on data obtained by MetaMedia, Inc. from Development Services Department of Gainesville/ Hall County, in the ROSS+associates' report permits issued in Hall County include data from both Gainesville and Hall County in some years and omit addition of Gainesville data in others. Specifically, both multi-family and single family detached permits in Gainesville in 1990 and 1991 were omitted from the totals. Single family detached permits for Gainesville were omitted for 1992. Basic addition errors occur in the single family detached permits issued in 1997, 1998, and 1999. When combined with the errors noted in (1) above, the net result is that seven of the ten years presented have incorrect totals of permits issued. For the year 1990 ROSS+associates identified persons per household figure was incorrectly selected and applied to the number of households, resulting in an inflated population in households and ultimately in the Hall County Total Population. Rather than use the census identified county-wide persons per household figure of 2.70, the census identified persons per owner-occupied unit figure of 2.72 was used. A simple comparison of the population total obtained by this mathematical exercise and the total provided by census would have pointed out the error. While each of these errors taken independent of one another might not be cause for concern, in aggregate they raise doubts about the overall veracity and quality of work being presented. Planning for the future demands good decisions based on reliable information. Gainesville and Hall County have a right to expect legitimate data be provided them by the consultants they have hired. ROSS+associates' forecasts have serious issues that need to be addressed before their data will be of use to Hall County or the City of Gainesville.